Day or night, spontaneous panic attacks occur suddenly and without warning. What are Spontaneous Panic Attacks? Uncued panic attacks are panic attacks (also called anxiety attacks) that come on spontaneously. This type of panic attack can occur at any time of the day or night, regardless of what you are doing. If you are sleeping, you will wake up in the midst of the attack, which generally occurs between the second and third stages of non-rem sleep. If you are awake when the panic attack hits, you may have been feeling calm, happy or relaxed at the time, but suddenly, you are gripped with an intense feeling of fear, dread or terror for no apparent reason. When an uncued panic attack strikes, your body goes through a number of physical, physiological and emotional changes. Typically the symptoms develop very quickly reaching their highest peak in approximately ten minutes and then gradually subside. For the feelings of fear to be classified as an uncued panic attack, you must experience at least four of the following symptoms. Although no one knows for sure the exact cause of panic attacks that are spontaneous, medical and scientific research has determined several possible contributing factors. When a person has a high level of stress that has built up over time, a final small amount of stress may be added. It is this incidence of added stress that may be the trigger that sets off a panic attack. Although it appears that there is not an apparent cause for the panic attack to occur, there actually is, even though the final stressor seems so insignificant at the time. Another possible contributing factor of uncued panic attacks may be genetic disposition. Research indicates that in certain families there is a genetic disposition for panic and anxiety. Those individuals are more prone to the possibility of suffering from uncued panic attacks. The possibility that the body learns the behavior of spontaneous panic attacks is another possible contributing factor. Since the body is unable to tell the difference between perceived and real danger, it becomes adapted to the occurrence of panic attacks. When this happens, the physiological changes that take place when danger is perceived or imagined cause the panic attack to occur. A panic attack that is spontaneous occurs without warning. It simply happens at anytime and anywhere. 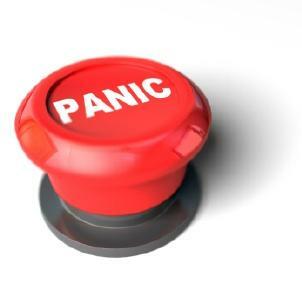 A cued panic attack, occurs as a result of a specific situation, condition, incident or place. For example, an individual that is afraid of spiders may have a cued panic attack at the sight of a spider or someone that is afraid to fly may experience a panic attack while on an airplane.